This benchmark software measures the 3D capabilities of your smartphone or tablet. In addition to the benchmark mode used to measure 3D capabilities, the software also comes equipped with a demo mode, which gives you real-time control over the 3D graphics used in the benchmark. The 3D graphics of Mobile GPU Mark use YEBIS 2 post-processing effects. Post-processing effects technology is used to create photorealistic CG images, and is an essential element of cutting-edge 3D game graphics. However, at the present time (2012), it is rarely used in real-time 3D content for smartphones and tablets because of processing speed issues. 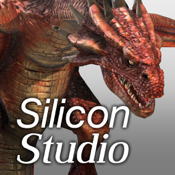 Mobile GPU Mark is a cutting-edge mobile application featuring the post-effect techniques used in top-of-the-line 3D graphics. Now, you can enjoy a rich 3D experience hitherto considered impossible on your mobile device.